Many door injuries are created by another type of automatic door that does not fit under the same standards or classification as the most frequently encountered standard high energy door systems. These low energy doors are semi-automatic and can be potentially life threatening. They are different and distinct in the sense that they are generally operated by a "knowing act". An example of a knowing act would be pushing a wall plate or button to begin to activate this type of door system. Once this type of door has been activated, an internal timer keeps the door open for a predetermined interval. When that pre-determined time period has ended (timed out) the door begins to close. A very important difference between high energy and low energy door systems is the fact that low energy doors are essentially "sensory blind doors". The requirements detailed in industry wide standards of high energy door systems contain parameters that must be met through multiple sensory devices. For example, an approach sensor, a presence sensor, and an egress sensor are commonplace with most high energy door systems. These types of doors must be checked on a daily basis with a specific protocol for verifying that all of the sensors are properly integrated and functioning. Since I have previously discussed daily safety checks in a current article, "The Ins and Outs of Automatic Door Operation", this article will not describe or detail appropriate tests and obligations for high energy doors. Alternatively, low energy doors do not need to employ a variety of external sensors to be standard compliant. In fact, the general governing factor for these doors is based upon the idea that they are really designed for handicap accessibility and act as "power assist" systems as well. 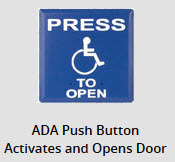 An ADA compliant push button, often found with the ADA symbol is used to activate the door system (knowing act). In addition, to alert the potential user that this doorway will self-open, industry wide approved round stickers are generally found on both sides of this type of door along with another sticker that attempts to make users aware that this is the type of automatic door that may activate at any time. The original idea for this type of doorway was to allow patrons in wheel chairs an easier access into a building that would otherwise only have a manual push or pull entry doorway. When these low energy door systems were in the early stages of development, my door and hardware contracting business assisted manufacturers and distributors in installing and beta testing many of these low energy doorway controls. We installed them in hundreds of office building bathrooms in Southern California to test the potential for ADA accessibility and product durability. At that time, these doors were then determined to be ADA compliant; however they lacked the sensory awareness for proximity or presence detection. The original low energy doors that were installed, when properly adjusted and set for low force movements were determined to be safe to use. During the user beta testing period, problems occurred when the force adjustments were tampered with by building maintenance staff or the electronics failed due to power surges in the building electrical systems. The maintenance staff often felt that the doors were taking too long to close. And, since most of the products we were testing were installed in public bathrooms, the building staff was not used to this type of delay when entering or leaving a restroom area. ADA compliance issues were in the early stages of development, and what is commonplace today was a new idea then. Contrary to the original design intentions for these low energy door systems, many building designers, owners, and architects have chosen to use this type of low traffic intended door system as a primary automatic door entry point. These door controllers were never intended for this type of routine entry or exit. They were developed for low volume user traffic and were never intended to perform in a high traffic volume environment. Many end users wanting automatic doors for their buildings thought that they could own an automatic door system for 20% of the cost of a high energy automated door product. This thinking is incorrect, and the function of the two different types of door systems is really not interchangeable. Improper usage of these low energy door systems has contributed to many severe injuries and death. Due to misplacement, misuse, and high levels of doorway traffic, owners of these low energy door systems who are unhappy with the way they function (generally because the wrong installed automatic door product is in place) have asked some service providers to come up with a solution to their problematic door systems. In response to requests from building owners, many service providers across the country have begun to add sensors to low energy "blind doors", similar to the type that are commonly found on the high energy automatic doorways. These system upgrades have proven relatively effective, but are subject to the same potential dangerous conditions that occur when daily safety inspections are not properly or consistently performed. The owner or management of any facility has the responsibility to perform all manufacturers recommended tests and safety checks every day. With modifications to these door systems, the management of the facilities needs to exercise the same vigilance and service plans as you would require on a high energy door system. Unless there is a specialized service agreement in place that specifically has an outside service provider inspect the doors daily, the daily supervision of these automatic door products is the exclusive responsibility of the facility management and staff. Properly operating low energy doors move at a slow rate of speed and with low force (approximately 10 lbf.) when activated. Another significant requirement is that the door automatically reverse itself or completely stop moving when it comes into contact with an obstruction during the closing cycle as the door returns to the threshold position. As an expert, I have consistently observed improperly adjusted doors that do not stall or reverse upon contact, and are moving with far greater speed and force then would be expected. This becomes a serious issue for users in wheel chairs as they can become trapped between the door and the door frame. One handicapped patron of a hotel actually broke his hand when an improperly adjusted low energy door slammed into his hand as he was wheeling through the opening. There are a variety of functions that can be found on different low energy door products, depending upon the manufacturer. Some feature a "Push and Go" type of mechanism that actually reacts to pressure or force from someone attempting to go through the doorway. That sort of feature can engage the motor to give the "power assisted" feature that was mentioned above. Some low energy doors only operate with a wall switch, and do not have any way to monitor the opposite side of the doorway. Others use overhead sensors or control mats to make sure that no one is on the opposite side of the doorway when a user activates the push button mechanism. Depending upon the age of the doorway, manufacturer, and the applicable standards in force at the time of installation, you can expect a "mixed bag" of potential options. It seems that the choice to install many low energy door systems has been dictated by the owners desire to cut costs and save money. As stated above, the cost of most low energy door systems is typically 20% of the cost of a high energy door system. When low energy doors are properly used in conjunction with automatic and manual doorways, they can be very effective. 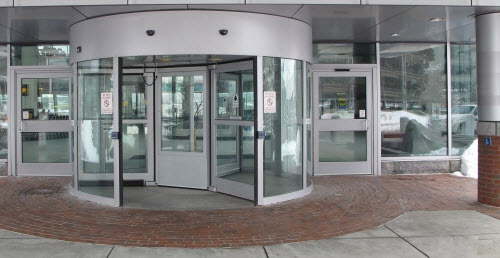 Many sophisticated installation configurations (as shown above) feature a specific entrance dedicated to ADA accessibility using a low energy door system adjacent to a high energy revolving door. Handicapped patrons in wheel chairs are generally accustomed to and informed about what to expect with low energy door systems. They understand that they have a "window of opportunity" or limited time period before the door will close when using low energy doors. They are not usually the patrons that are injured from this type of door system. It is of the utmost importance with low energy or any automatic door system, that the management of the facility where these products are installed routinely performs daily safety inspections and regularly scheduled periodic maintenance. Door systems become damaged, lose their proper adjustments, and do not function as intended by the manufacturer simply because doors are not properly maintained. It is the responsibility of every facility that has any automatic door system of any kind to provide as safe an environment for their patrons as possible. Whether it is a hotel, casino, airport, retail store, or restaurant that uses these types of doors, daily safety inspections and routine periodic service from a qualified professional service provider is essential.